‘Fennel’ who having fulfilled his role as company for the second pig until our new girl arrived. Fulfilled his other intended purpose and is currently stocking the freezer. The second ‘Mustard’ a Berkshire barrow (castrated male) we purchased with ‘Fennel’(from the same people) though he was a lot younger and smaller. And has since been residing in a ‘piglet pen’ with Rosemary our most recent addition. Personally we don’t castrate our own pigs for our own consumption. However we have learned that there is often requests for this locally. As there is a general belief in ‘bore taint’. We have never experienced this, however most of our porkers do not reach ‘working’ age. But I guess this will be an experient for us. If anything it seems to have set him back in size, by comparison to those we have kept from our own litters. 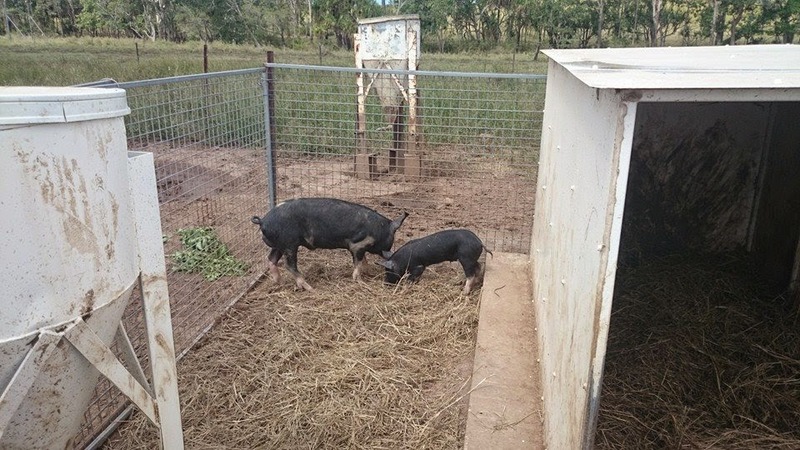 Anyway, back in December we decided we wanted a second breeding sow. So began making enquiries to source a piglet from another bloodline. I guess eventually Smokey and Sage for that matter, will retire, so it would be good if we could keep a bore from our thier stock that would not be related to this sow. And since we were contacting other breeders (though we don’t really consider ourselves breeders, as such, though we do breed them, so guess we are really) we thought we might source a ‘porker’ for ourselves. Given we lost a piglet with our last litter, leaving us porkless, or at least low on pork supplies. So we found ‘Rosemary’ our new girl, who we picked up from a certified breeder just after new year. And ‘Mustard’, as Berkshire barrow (castrated male) who arrived just before Christmas, along with a company porker; a slightly older male cross,‘Fennel’ (as pigs are social they really shouldn’t be kept alone) from another smallholder. Fennel having served his purpose of keeping Mustard company until Rosemary arrived. Fulfilled his other purpose of stocking our freezer earlier in the month, before he became a working bore. So now that Rosemary and Mustard are a lot bigger (though Rosemary although supposedly 3 weeks younger, is still a lot bigger), it was about time we introduced them to the ‘big pig pen’. And our big pigs- Smokey and Sage. Integration has gone reasonably well. We only had one attempted escape; in that Rosemary, being the more adventurous of the two, explored the grass outside their fence along the roadside! Tip number 1 when introducing livestock to a new environment (especially when there are other animals inhabiting it)- Check your electric fencing is working before hand! Fortunately Rosemary only took a little encouragement to go back into the pen. And no I didn't take photos I was too busy getting her back in. We have since replaced the section that had burned out; probably due to the chickens going under it and shorting it out on the barb- downside of free range birds, they have no boundaries! Either way you’d think we should have learned by now and not make such a basic error. Now the fence is working, the little ones have tested it on more than one occasion and seem to be learning to respect it. But generally seem happy to run about, play and wallow. They are learning not to interfere with the bigger pig’s food. So we have been trying to spread it around, whilst keeping them near in the hope of minimising stuffles over food. But there’s still plenty of grazing and grass clipping regardless. So no one is going to go hungry. Generally they all seem to be getting along. As I’ve mentioned before they are social animals and will naturally congregate. And the little ones have been spotted snuggling up to the big guys- I’ll try and get a pic… it’s very cute. So watch this space and we will keep you up to date.